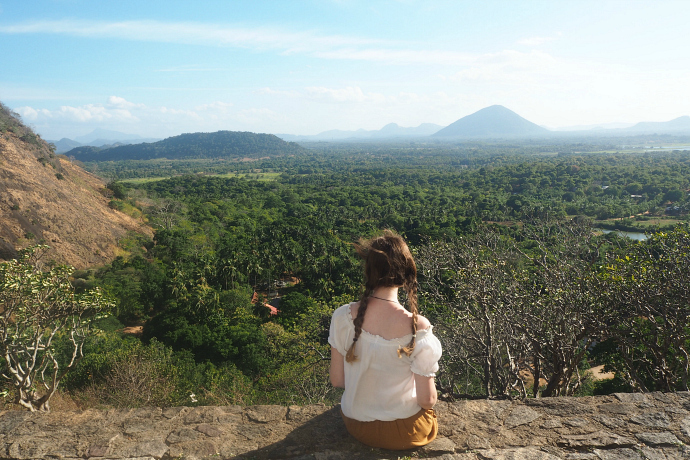 Dambulla was the third stop on my trip around Sri Lanka and the furthest North that we went. We caught the bus from Polonnarawu, this took around two hours and was my first experience of buses in Sri Lanka. Let's just say it was rather intense! We'd decided to get a tuk tuk to the bus station rather than the nearest bus stop as this is where the bus started and we'd have more chance of getting a seat. We did get a seat but it soon got very packed and although I was thankful for my seat it was still very squishy so I'm very glad I wasn't standing up. As the journey went on I'm not even sure how they kept fitting more people on! The bus was also a bit of a party bus the bus driver had music blaring and flashing buddhas all around his seat. It was quite entertaining but the music got a bit too much after about half an hour. But on the plus side the bus journey wasn't very long and no where near as hot and sweaty as I'd imagined. The bus cost 100 rupees. We were going to get the train but this seemed more complicated and the bus ran pretty regularly and was very cheap. When we got off the bus in Dambulla we were greeted by lots of tuk tuk drivers telling us they'd take us to our accommodation. We were going to get a tuk tuk but then one driver kindly told us that we could walk to our guesthouse and pointed us in the right direction. I do kind of wish that we'd paid for a tuk tuk, the walk wasn't that long but it was on a dirt track and it was very hot and I was extremely tired making my bag feel ten times heavier. I did make it, I managed to lose my travel pillow on the way but thankfully a car driving down the dirt track found it and gave it back to me. I guess it's not that hard to figure out who the bright pink pillow belongs to when there's two girls walking with massive rucksacks on and no other tourists in sight. Our day began quite the same we headed into the main town which was around a ten minute walk from our guest house. We soon discovered that this walk was rather creepy at night when it was pitch black. We had to resort to using our phones as a torch, I also got bitten by something and boy did it hurt. I still have no idea what it was but it flew into me, I think I'd rather not know; it definitely wasn't a mosquito. After eating lunch in town we headed back to our guesthouse where our host kindly offered to drive us to the cave temples. We went in the late afternoon to avoid it being too hot. I always try and do things in the morning or late afternoon to avoid the heat, I'm rather bad at dealing with the heat so I'd rather enjoy sightseeing when I don't want to curl up in a heap in the shade. We were dropped in the car park for the cave temples, you then walk through a rather strange area which reminded a little of a theme park. There weren't any rides but it was all very brightly coloured. Make sure you buy your ticket from the ticket office here or you may get to the top to find you have to walk all the way back down again. The walk to the caves takes about 15 minutes and isn't too demanding. It's quite easy to stop if for a rest if you wish and various points of the walk are in the shade. You should also be aware of the monkeys. Avoid eating (and drinking) anything around them as they will steal it. You have to pay 25 rupees for shoe storage, there isn't particularly a choice on this but it's not a lot of money. Make sure your money doesn't blow away though as it's very windy! Just after the shoe storage area you'll go through an arch way area where you show your ticket. Just before you reach this there's an area on your left where you can get some really nice photos of the views, such as the two picture below. When we were there not many people stopped to use this area for pictures so it's worth stopping before or after your visit. Also, the views from the temple area isn't quite a good because there is a fence blocking some of it. After taking some pictures we headed to the caves. We decided to start at the furthest away cave as we'd read that the first one was the best. After seeing all of them I would partially agree but I preferred some of the other caves. Whilst each is fairly similar there are enough differences between the temple caves for each to be as interesting as the last. 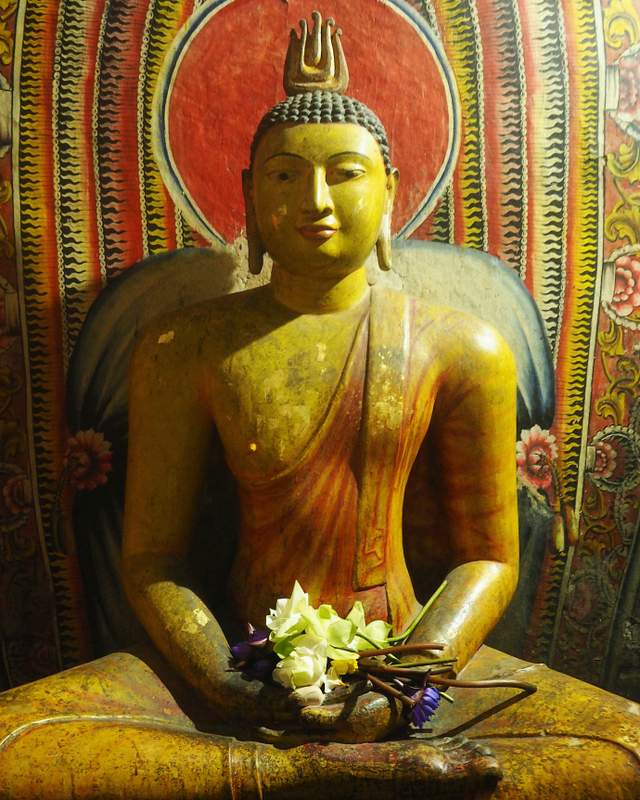 Each caves is home to various buddhas and wall drawings. 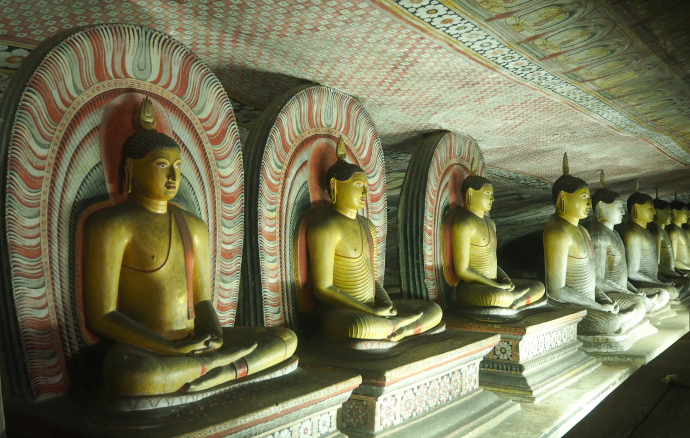 Although, I didn't actually see that many temples while I was in Sri Lanka I think the cave temples were my favourite. And also the prettiest. I've included some photos from the temples for you to have a look at but not too many as I don't want to ruin the caves for you! We probably spent no more than an hour looking at the caves. You could do them in more or less time depending on how long you want to look at each one. There were a number of tour groups, if you wanted to know about the history of the caves then this may be something to consider. However, I was happy to just look and have a quick google afterwards. We got a tuk tuk back to the town centre, I'm afraid I didn't make a note of this price. 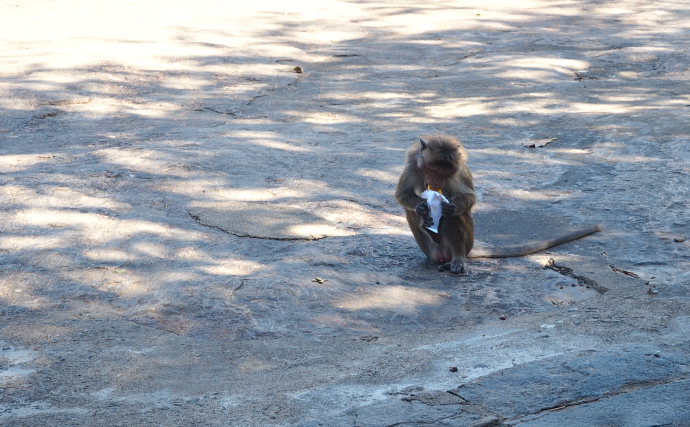 There's a main street in Dambulla where all of the main shops and food seems to be (and also a few banks). We didn't spend that much time exploring the actual town so there may have been more streets but everything we wanted and needed was along this street. This was also the street that the dirt track from our guesthouse led to. There was a supermarket (Food City) as soon as you got the main street. This had snacks and water as well as lots of other things. Very good for stocking up especially for simple toiletries. While I don't have any pictures of the food I thought it was worth telling you about the places. Benthota Bake House: We had curry and rice for 130 rupees. This place was quite strange. It was a bakery/food shop and then had a restaurant. We realised this was quite common in Sri Lanka. The restaurant had quite a few locals but also a lot of tourists. Our host had told us about it so maybe lots of tourists are also told. In all honesty, it was cheap but not that great. The food was average and the service was bad. We had to keep asking for a menu and only got to order food when a local man decided to order for us because we were being ignored. I'm still not quite sure why we were being ignored as other tourists seem to order just fine. Mango Mango: This was an air conditioned restaurant and thus full of tourists. Definitely not somewhere to go if you want to discover local cuisine. We were a bit fed up of curry and rice so tried it out. We ate here twice. The first time I had black bean chicken with rice, the second noodles and a veggie toasted sandwich. The food was pretty good and the sandwich was really good considering we were in Asia. I found bread/ sandwiches sometimes a little strange in Asia so was pleasantly surprised. This was more pricy but still reasonable. There was wifi and large TVs. They also served cakes (which were also pretty good!). My Burger: Slightly strange name if you ask me. This restaurant had quite a mixture of food options. There was traditional curry but this seemed to only be an option at lunchtime and burgers and even some Arabic food. The lassi's here were pretty good. Our guesthouse was called Roberts Inn. It was around a ten minute walk to the main street. Our room cost 4000 rupees for three nights. This price was between two of us. Our room had two beds, however, I wouldn't say there were doubles. I had to sleep at an angle as the bed was too short and Kate who's pretty short struggled a bit too. If you were a couple and sharing a bed then it may be very tight but I'm not sure if this was just our room so they could fit in two beds. That was the only really negative. Our hosts were lovely, Robert's youngest daughter had her birthday while we were there and we were invited to the party there were having. 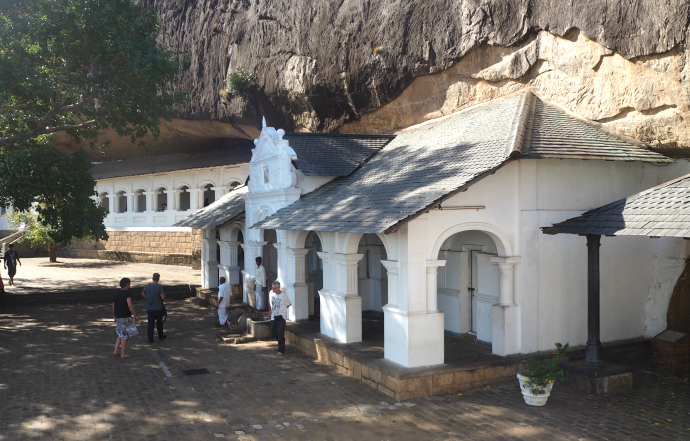 They also took us to Dambulla Cave temples free of charge and dropped us at the bus the following day. 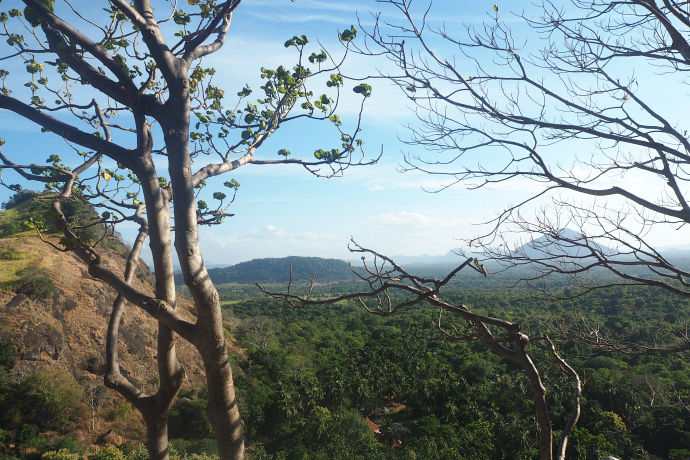 They offered various paid tours to sights around Dambulla at fairly reasonable prices. There are people selling souvenirs on the way up to the caves, I purchased a lovely wall hanging for 400 rupees. Don't be afraid to barter but also remember to be reasonable. 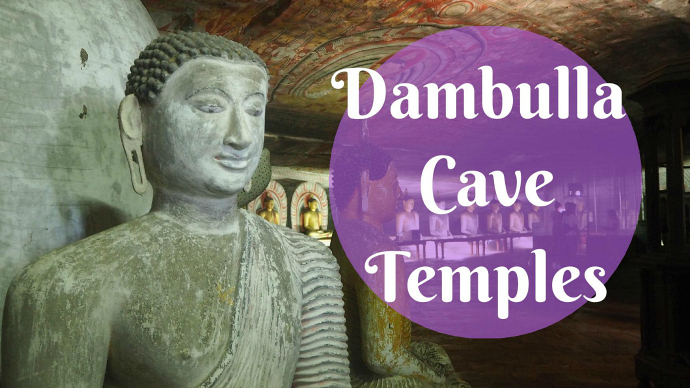 Have you visited Dambulla? What were your thoughts on the town and the sights? 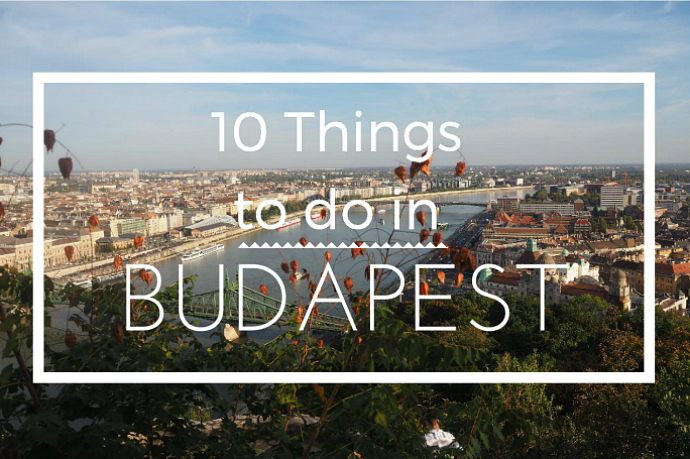 In September I spent three days in Budapest, I enjoyed exploring the city and thought I'd share 10 things to do in Budapest. 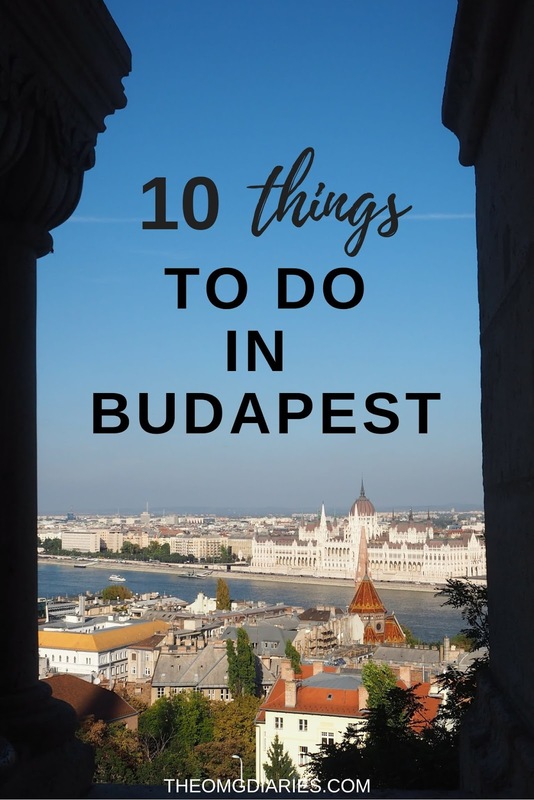 I've tried to include a range of activities and not just the usual things so hopefully this will be useful for anyone planning a trip to Budapest. You can't google Budapest without a picture of one of the many thermal baths popping up. Probably the most famous of the baths is the Szechenyi baths. This is also were Sparty is located. I didn't actually get to visit the baths in the day which is my biggest regret from my visit to Budapest. If I ever go back visiting one of the baths is top of my list. 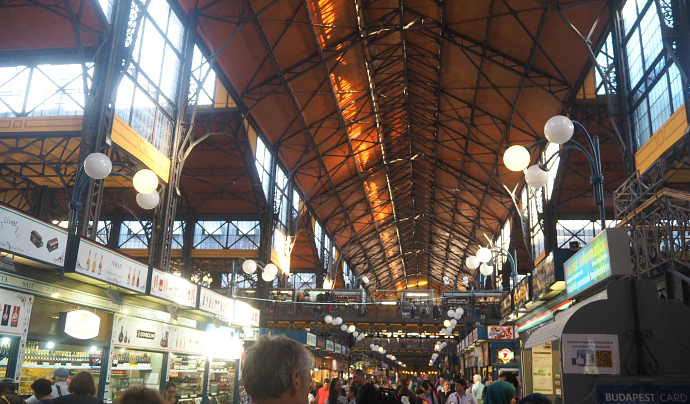 There are a few markets in Budapest. We visited the central market. There's plenty of local food to try, slightly overpriced. I'd recommend sharing a dish as the portions are quite large. There's also food stalls and souvenirs. The name of this museum is probably a bit misleading, it's not a house of horrors type museum. In fact, it's a museum with information about the fascist and communist regimes in Hungary. Two people recommended this to us and said it was a very good museum. We unfortunately didn't get chance to visit but if I go back it will be on my to do list. If you want to do something a bit more historical then you should try this out. I wish I'd gotten a chance to visit as I don't feel like I learnt as much about Hungary's history compared to other countries I've visited such as Poland. 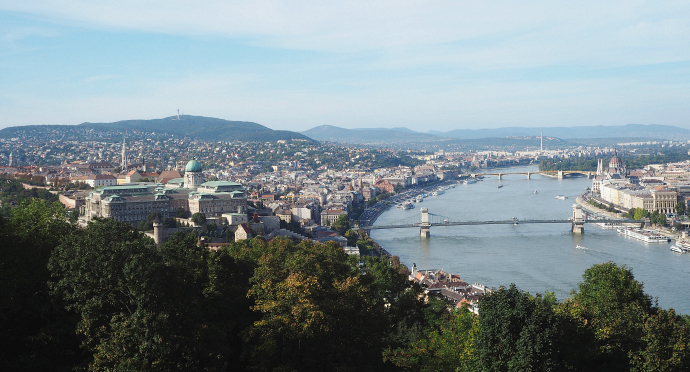 Budapest used to be two separate cities separated by the river. The river still separates the two halves but now they are one city. We stayed on the Pest side. 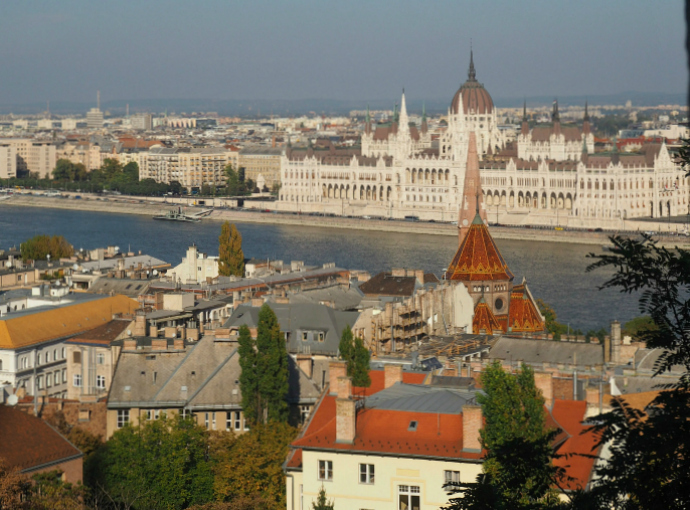 The Citadel and Fishermans Bastion are on the Buda side, while the Basilica and Parliament are on the Pest side. This side seems to be were the main city is while the Buda side is slightly more residential. 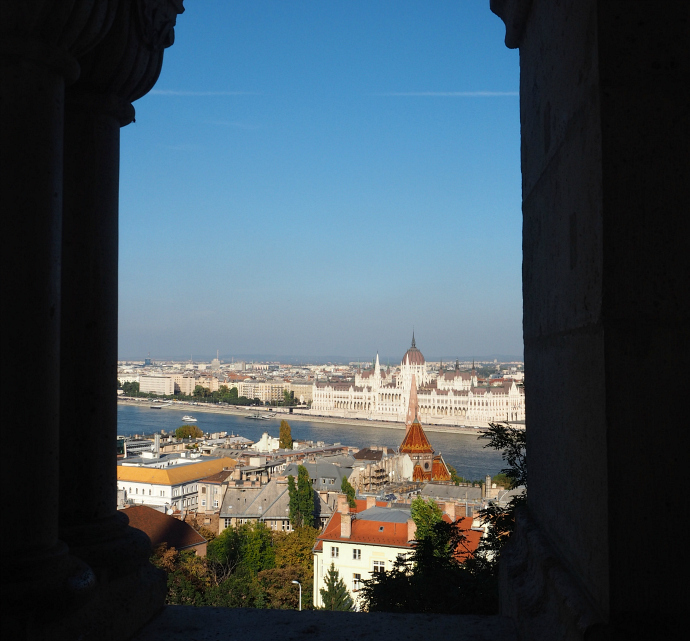 It is very easy to go between the sides, which are split by the Danube river, either by the metro or walking over one the bridges. I wish we'd had time to visit more of these and visit them in the day, as well as, the evening. We visited Szimpla, one of the more well known ruin bars on our way to Sparty. There were tonnes of different rooms to explore and a photo booth which we obviously took advantage off even though people kept trying to photo bomb us. The photo booth cost around £2 but I love them so much! There are various ways to walk up to the Citadel. 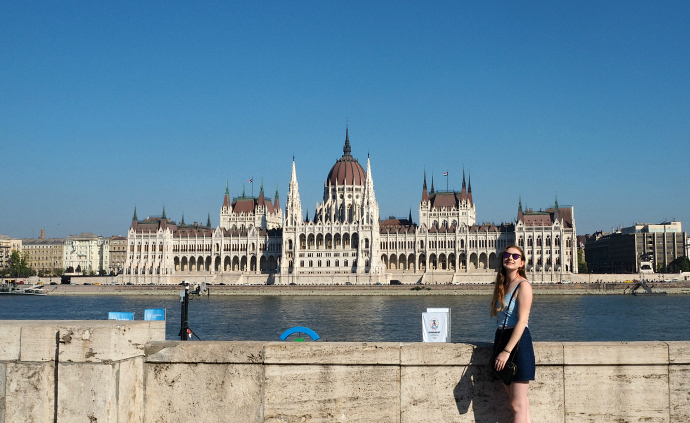 We walked up on our first day in Budapest, considering it was October it was pretty hot, it was over 30 degrees! Thankfully, a lot of the walk was in the shade. The views were amazing. However, I didn't love the amount of bugs at the top. One of my friends called them sting bugs but I'm still unsure if they were or if she'd just made the name up! Other than the bugs it was a great place to sit and relax whilst enjoying the views. The Fishermans Bastion is both beautiful and slightly odd. I say odd because the architecture is so different but it doesn't feel old it feels a bit like it was made for disneyland. However, it's still worth a visit and you can visit for free! The toilets cost money and I think some of the view points do as well but the over all area is free to walk around. There's a restaurant which overlooks the river that has lovely views. We ate here but I found it expensive, the food was traditional but made for tourists. I'd say skip it or just have a drink. We ate there because we really needed food but in hindsight we should of eaten before we walked up. There are plenty of picture opportunities and it's a great place to relax. There's plenty of options for brunch in Budapest. We only tried two of them out. 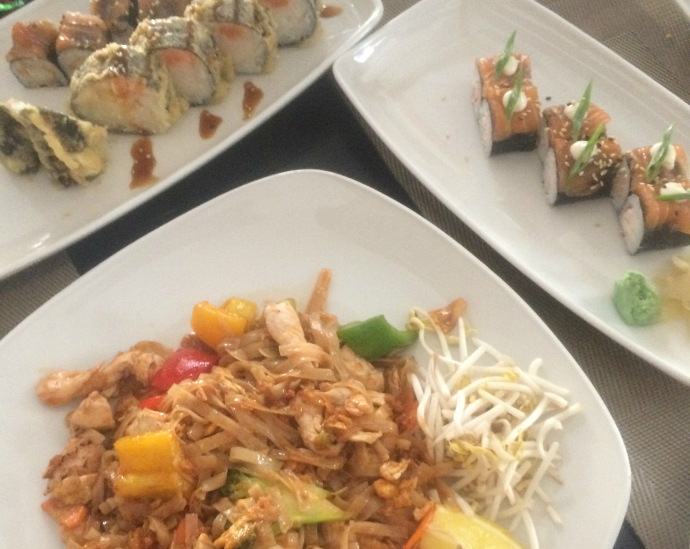 There's also a great range of restaurants in general. We found a really good sushi restaurant and while I don't usually eat at the same place twice (because obviously I want to try as many places as possible) we returned to this restaurant the following day. Partly because one of my friends hadn't come with us the first time and want to try it out and partly so I could eat all the sushi again! We crossed the river to get a picture of the Parliament Building. We didn't spend that much time looking at it but it's more of a have a quick look and take a picture thing to do. I like these because they're quick and can be done in between other sights. We stopped off before making our way up to the Fishermans Bastion. I would have loved to see it at night when it was all lit up but we never got a chance, if you can I'd definitely recommend seeing it at night as well because it looks stunning! I saved this for last because it's probably not to everyone's taste. Sparty is basically a night out in the thermal baths. There's music, drink and a lot of drunk people. We spent so long researching this and whether it was worth going to. We wanted to go but there was a lot of negative reviews of it. Even on our travels we got mixed reviews about the event. Although, it seemed most people who had a negative story to tell us hadn't been to the event themselves and had rather heard it from someone else. We opted not to buy tickets in advance and got them from our hostel. My personal opinion is that Sparty is nowhere near as bad as some of the reviews suggest. Todays post, as the title suggests, is all about Interrail passes. 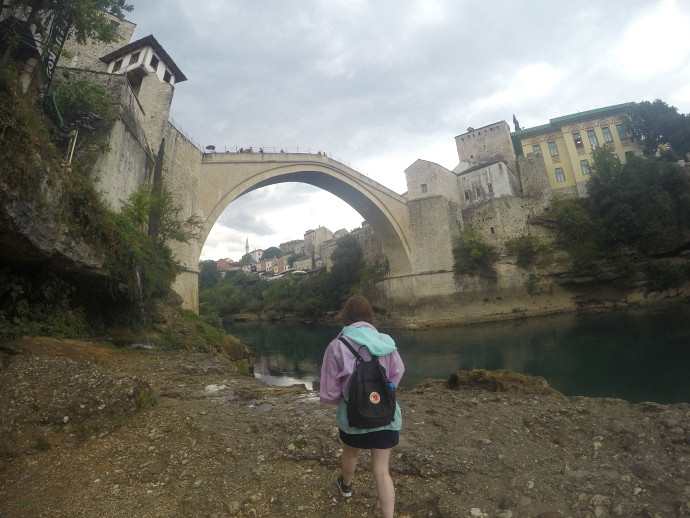 In September I went interrailing for five and a half weeks along with two of my university friends. This doesn't make me an expert but I've learnt a lot about the pass and how to use it so I thought I'd create a guide to help others thinking about buying a pass themselves. Most of you will probably know this already but the Interrail Pass is a pass that allows you to travel through Europe by train. There are various options for the pass depending on how long and often you plan to travel, I'll go into more detail about this later on in the post. 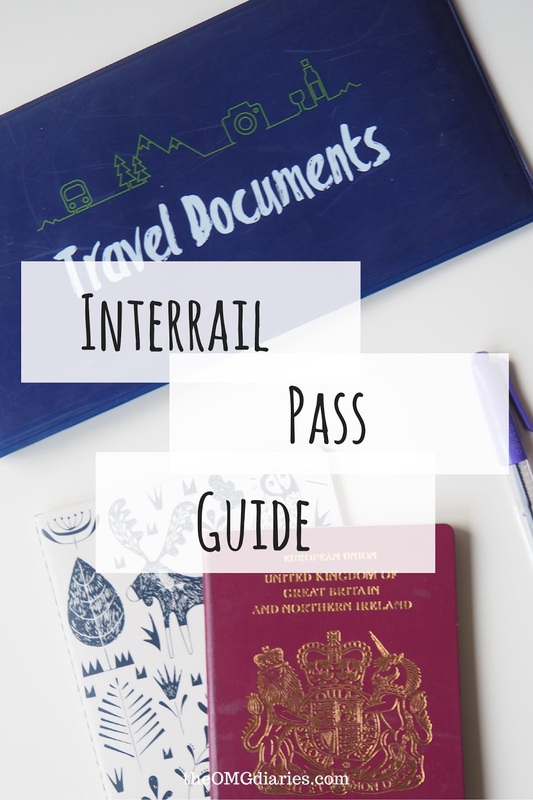 One thing that should be noted is that you cannot use the interrail pass in your own country, for example, I wouldn't be able to use it in the UK. I don't think this is a negative as the reason you buy a interrail pass is to explore new countries! The Interrail pass is called a Eurail pass for those outside of Europe. Just hop on over to the Interrail website and follow the instructions. They offer protection for your tickets if you want the extra safety net just incase your pass gets lost in the post! The pass is delivered using first class and usually arrives within a couple of days of ordering. This pass allows you to travel whenever you want within a certain time span. Basically, with this pass you don't need to count or worry about the number of trains you take. It's unlimited within the time span you've chosen. The second kind of pass does limit the amount of journeys you take and the amount of days you're able to take journeys on. 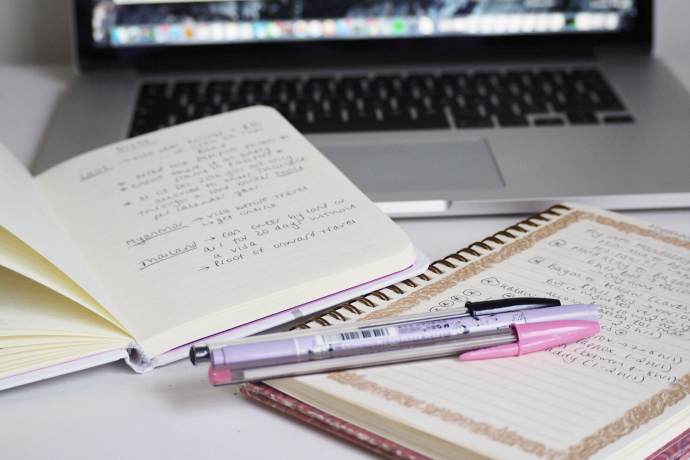 For example, I purchased the 10 within 1 month. This meant I could have ten travel days/ rides. These did not have to be consecutive but had to all be within a month. It's best not to rush into buying a pass even if this means missing out on any discounts. I initially thought I needed a one month continuous pass but after looking at my route again realised I could save money and get the 10 days within a month pass. So even if I had purchased the continuos pass with a discount I still would have spent more than I needed to. It's best to work out your route in more detail so you have a better idea of how many trains you will need to take. This completely depends on what type of pass you choose. The global (more than one country) pass range from £182 to £434. I purchased the 10 days within a month pass, this cost me £265. Interrail offer various discounts throughout the year on the passes. You can buy your pass during the discount but don't have to use it straight away. You have up to 11 months to travel on it. At the moment Interrail are offering 15% off passes (until the 31st March 2017). If you need transport for more than a month then you have to purchase another pass. However, I would recommend taking coaches if this is the case. We used our interrail pass for a month but when we first began our trip we used coaches so we didn't have to purchase another pass. We wouldn't have been able to just get a pass with more travel days as our trip was five and a half weeks and no pass offers travel for more than a month. Coaches are relatively cheap especially in Eastern Europe. There are youth prices, I think anyone up to the age of 25 falls into this category so make sure you buy this pass if you are 25 or under as it saves you a fair bit of money! 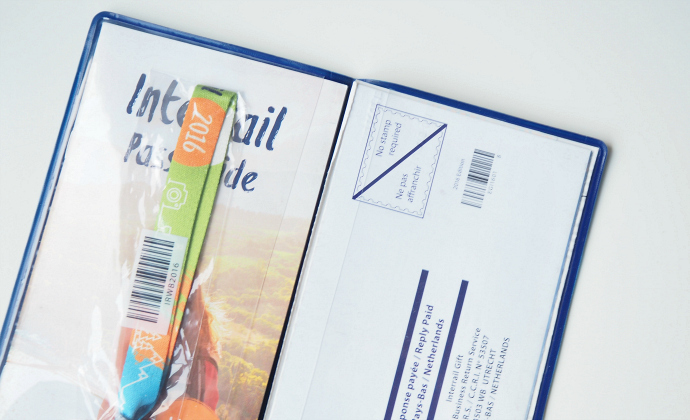 When you open up your Interrail Pass you'll find various items. Firstly, the actual pass holder which is a blue wallet. You'll also get a map, the actual pass which is where you fill in all your journeys, a wristband and a order summary. 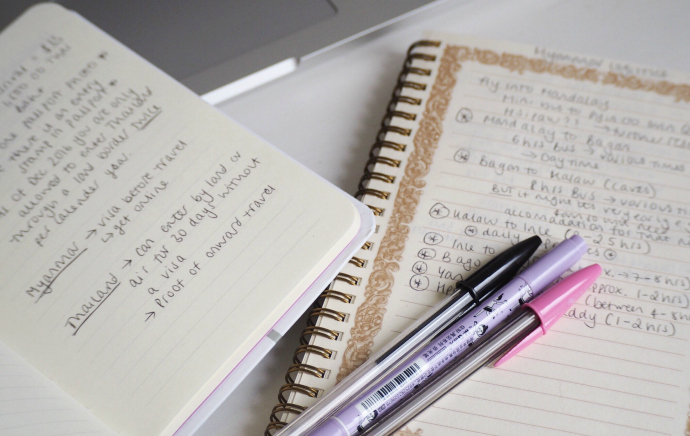 You can use your map to mark out your itinerary. I only got my pass on the day my trip as it had been delivered to my friends house since I was away. But if I'd received it before the trip I would have definitely mapped out my route. The wristband is just a souvenir I think. When we first opened the pack we assumed we had to wear it but there was no information about it so we didn't bother. Good job we didn't as it isn't necessary at all. The only thing that is necessary to always have easy access to when using transport is the pass. 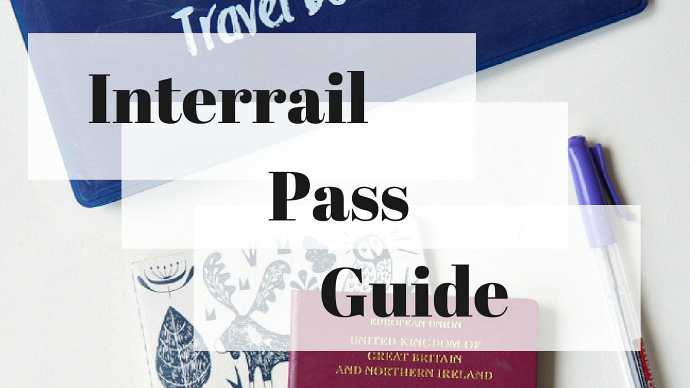 If you have an Interrail Pass (rather than a Eurail one) then you don't need to do anything with your pass beforehand. 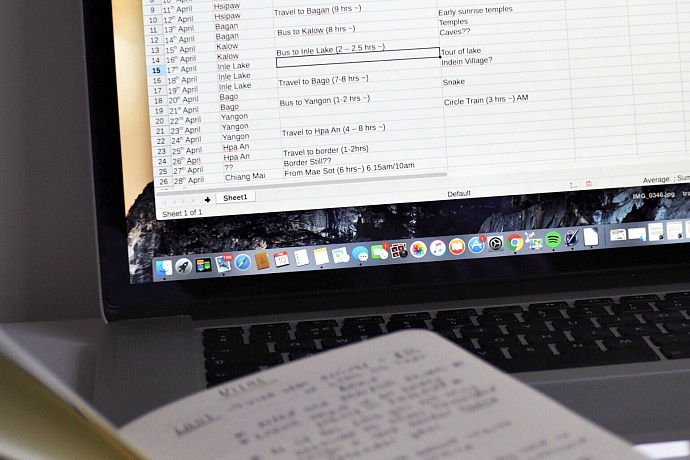 Simply check all the details are correct and hop on your first train! Fill in your pass and show the pass when they come to check tickets. 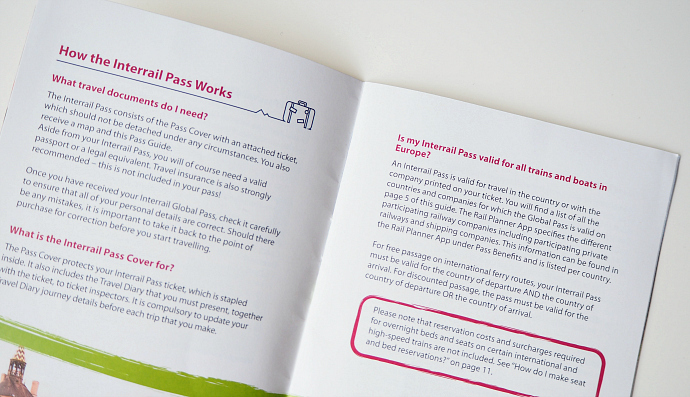 If you have a Eurail pass then you will need to validate your pass before it's first use. This can be done at a train station before its first use. Those who have the Interrail Pass don't have to do this. 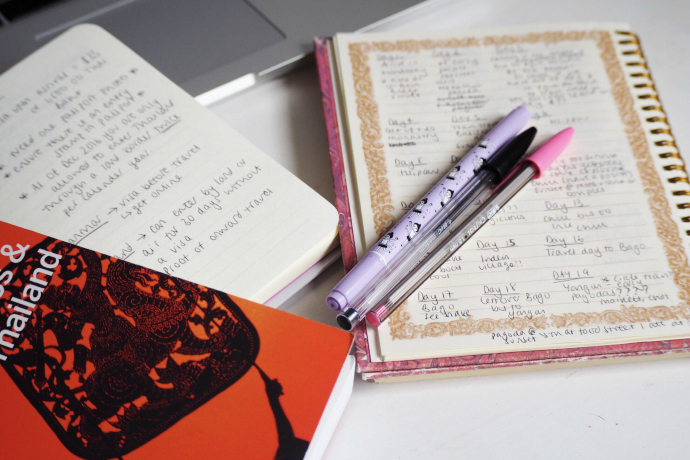 You must ensure that you fill the pass out each time you take a journey. I never did this before I was on the train just in case our plans changed but I made sure I did it as soon as I was on the train. In some cases our pass wasn't even checked or it was checked but not dated or stamped. When this happened we asked in the ticket office at the station we got off at whether it mattered if the pass was stamped, they said it did not as we'd filled it out and done everything we needed. Another reason for not filling it out until you are on the train/ know you're definitely getting that specific train is if you make a mistake filling in the date of travel then you lose that journey. 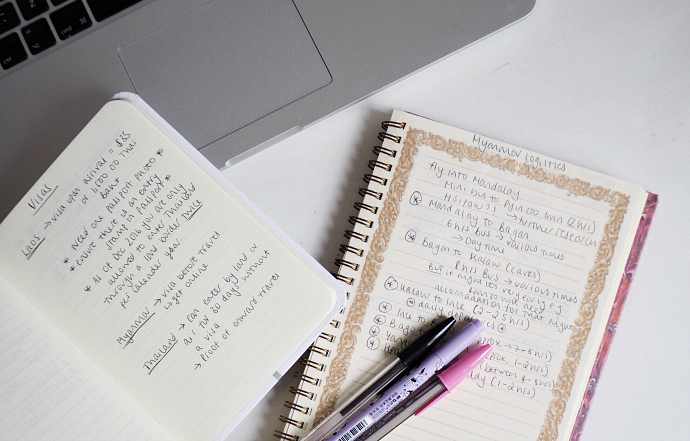 Say you accidentally put the wrong date and cannot correct it without crossing it out and having to use a new date box you don't get that box back. If I'd filled out one of my dates wrong then I would have lost that travel day and only had nine journeys rather than the ten. I don't think this matters for the continuous pass, I'm pretty sure you don't need to use the date boxes on the pass for this pass because you don't have any limit on the amount of days you can travel on. 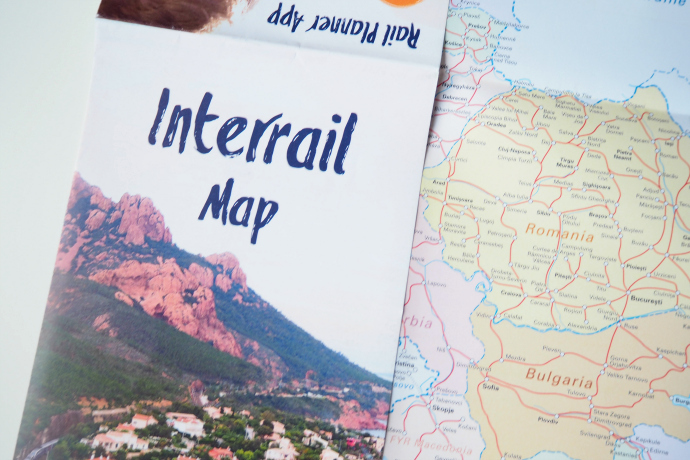 While the Interrail Pass covers all of your train journeys (and occasionally other forms of transport, best to check individual countries on the website) it does not cover any reservations that may be required on these journeys. If reservations are required then you must ensure that you make the reservation and pay the fee. You can do this online or at the station you're leaving from. Reservations do mean that you have to be more organised, there may be none left if you leave it too late. I only had to make reservations for trains in Poland, every other train I took I just got on and filled in my pass. Both times I needed a reservation we ended up getting them on the actual day of travel. This was only because both times we'd arrived at our destination in the evening and the ticket offices had been closed. We allowed extra time and had a back up plan of getting a coach if there were no reservations left. Luckily, we were ok both times but it was stressful not knowing if we would get on the train or not. I hope this post has been useful for anyone considering purchasing an Interrail Pass. My Interrail trip was amazing and a great way to explore Europe. I'd love to go interrailing again, maybe just around Italy. If you do go interrailing I also recommend downloading the Interrail app. It can be used without internet and tells you all the train times. I used this to plan all my journeys, it tells you all the stops, the length of the journey and whether any parts of it did a reservation. 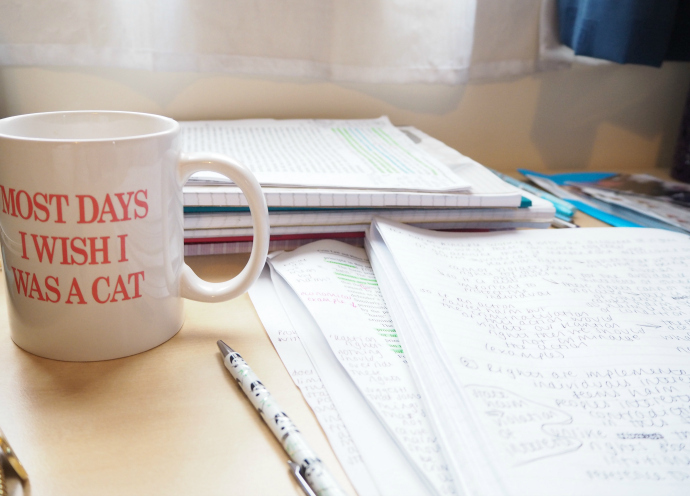 It's honestly so useful! 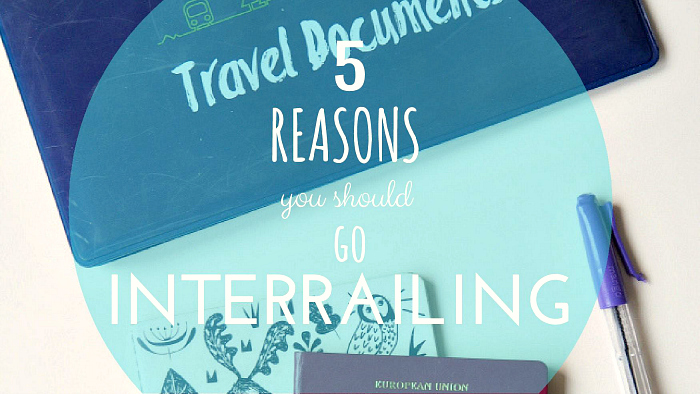 Have you ever been interrailing? What countries did you visit? 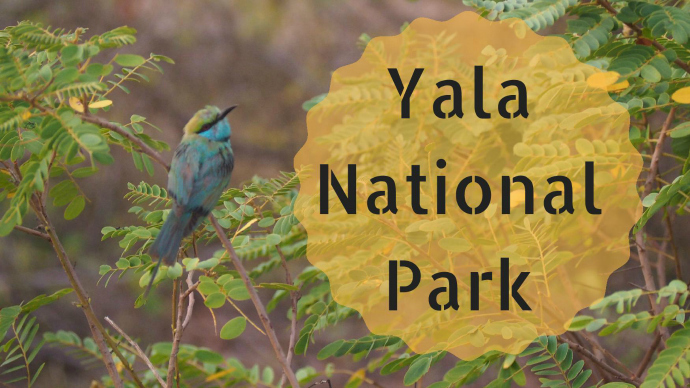 Yala National Park is the second largest and most visited national park in Sri Lanka. 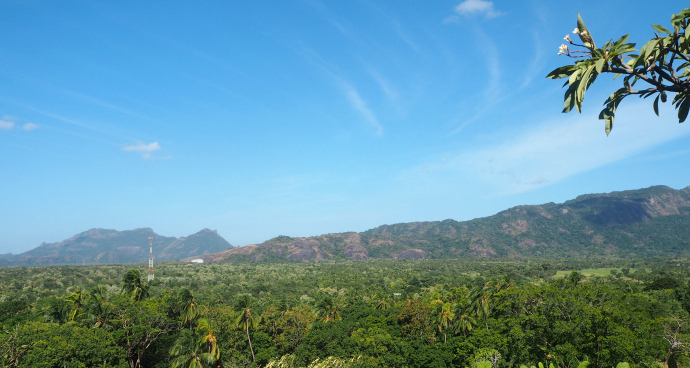 I did quite a lot of research on the different national parks in Sri Lanka to see which one was the best to visit. I actually decided against Yala National Park and favoured Minneraya. 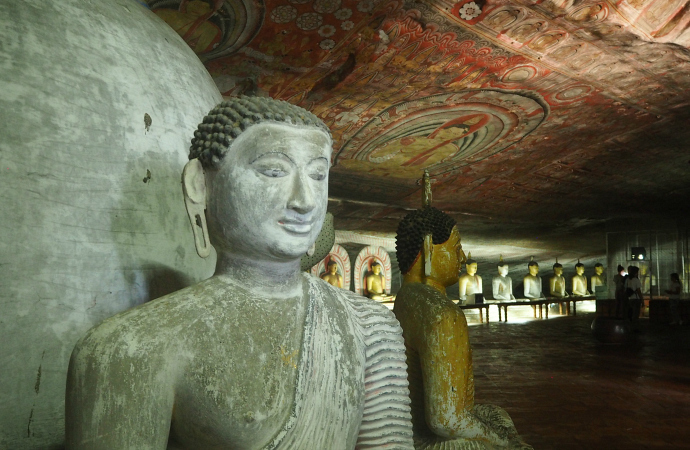 However, due to our route and after some further research we finally chose Yala. When planning my trip to Sri Lanka I'd imagined lots of 5 am starts. But this wasn't actually the case. In fact, my trip to Yala National Park was probably the earliest I'd been up the whole trip, apart from my visit to the Taj Mahal of course! I'm the first to admit that I'm not a morning person, I don't try and pretend I am. I like my sleep. A lot. But when my alarm went off I got out of bed rather easily. This may have had something to do with the fact that I had a double bed to myself and we'd treated ourselves to a nice hotel (with aircon!) 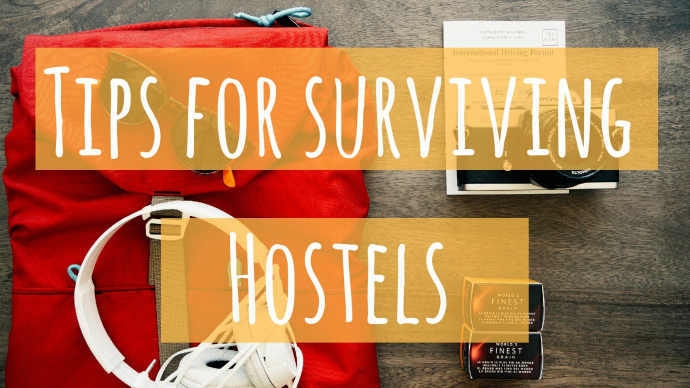 rather than the usual hostel or guest house. I was the definition of bed head on the safari but hey when you're on the look out for elephants and leopards who cares! I got up and dressed, ate a slightly stale muffin so I didn't get too hungry on the tour and headed to the hotel lobby. Our driver was waiting. And so we headed off into the pitch black ready for our safari. It wasn't long until we started seeing other jeeps. I can only describe the pitch black drive in the jeep as the wacky races (remember that TV show?!). Or should I say what I imagine the wacky races to be like in real life. The jeeps went so quick! We kept overtaking ones and then they would overtake us again. They'd be sharp turns in the road that we'd shoot around. If I wasn't awake already I definitely was after this drive. I decided to sit back and try not to think about the fact that our driver was overtaking other jeeps at an incredible spend in the pitch black. All the drivers seemed to be in one big race. And I guess in a sense we were. The race was to get to the ticket area for the park. Once we got there we parked up and our driver collected our money. After about five minutes we were off again, this time heading to the actual entrance. This is why the journey had turned into wacky races. Everyone wants to be as near to the front of the queue as possible. We got there about 15 minutes before the park opened and were already about ten jeeps back. The queue behind us quickly increased too. 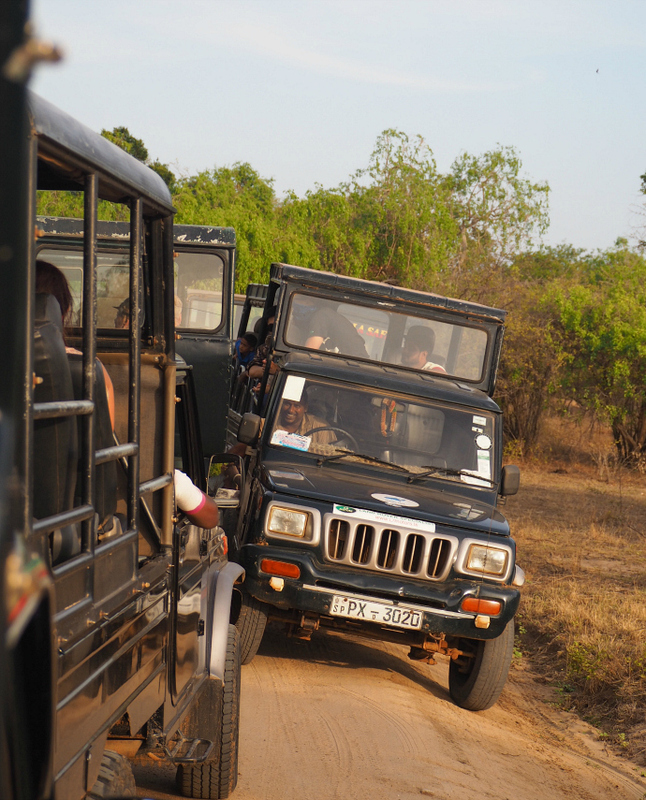 When the park opened the jeeps lined up sped in, while most followed the same route some began to split off and head down other dirt tracks. Our driver seemed to be pretty good at knowing where to go. He was on his walkie talkie a lot. I think a lot of the drivers talk to one another and tell each other any animals they spot. We started to see animals quite quickly. 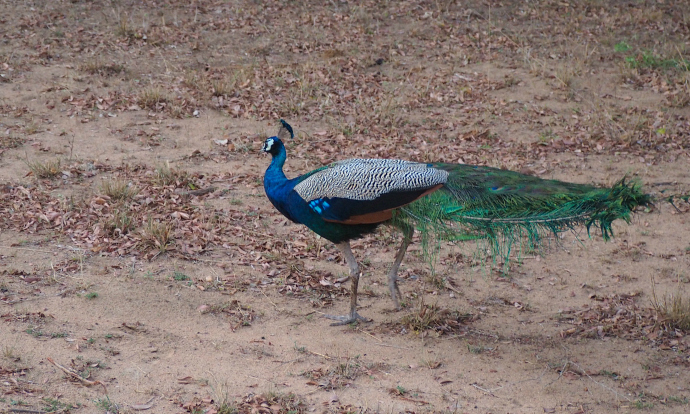 We saw peacocks, a fox, some crocodiles. All were quite far away but I had my zoom lens on my camera so was able to use that to take pictures/ use as binoculars. In hindsight, I should of worn my glasses as I did struggle to see things sometimes. We headed off to a quieter area of the park, our driver then got a message saying that there may be leopards. This was the main reason we chose Yala so we really hoped we could see one. We first went to the area they were spotted but there was no sightings. Then we moved to another area where there were already some jeeps. We parked up and waited. We were there for about a good ten to fifteen minutes. That's part of the safari though, you need to wait and see if the animals appear. It's not something that can happen instantly. They're wild animals so you may go and not see any. 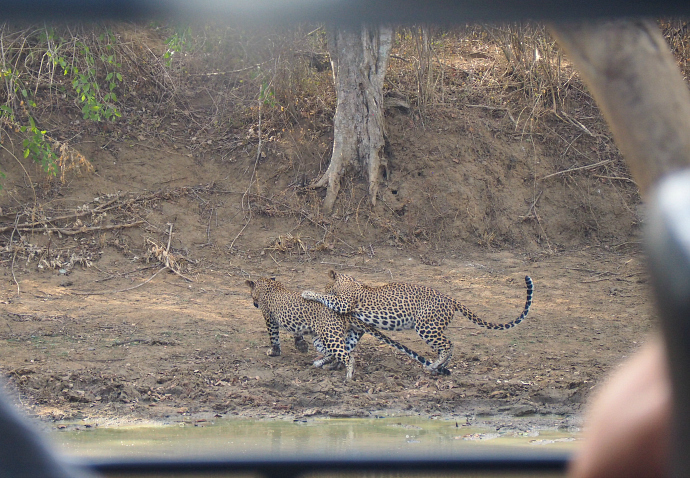 We very nearly left to go to another area of the park when one of the other jeeps motioned that there was a leopard. It then turned a bit chaotic. The jeeps all shot forward, trying to get nearer to the area. At this point there was about five jeeps. It took me forever to spot the leopard. Mostly because I wasn't wearing my glasses. Kate kept pointing to where it was and I just couldn't spot it. But then I did! 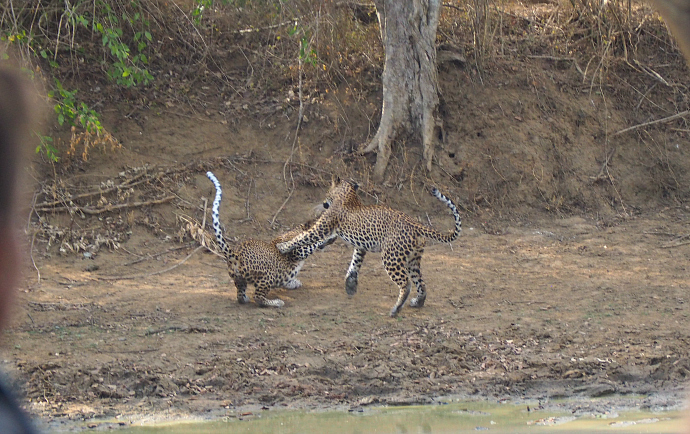 We were incredibly lucky as another leopard appeared and the a youngster! Our driver said this was quite rare. It must have been because our driver seemed more excited than us! He took my camera and took some photos for me which were really good! Then even more jeeps arrived, there were about 50 people in various jeeps leaning out trying to get a look at the leopards. It was quite bizarre. By this point we were quite far back meaning jeeps were blocking our view, however, they couldn't move as there was no where to go. There was a child in the front jeep just casually eating his food and not even paying attention to the leopards right beside him! After getting some pictures and watching the leopards play we headed off. Just in time because more jeeps were coming to the area. Our driver proudly told every other jeep we passed about our sighting. After the excitement of the leopards we didn't see many more animals. I was really hoping for some elephants but seeing the leopards definitely made up for this. 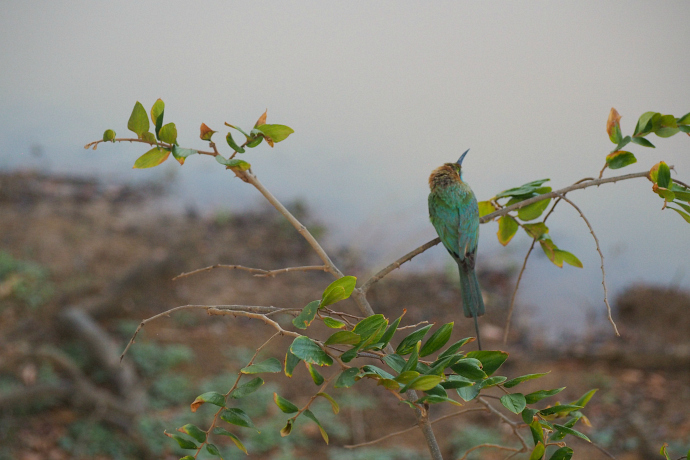 We saw some warthogs and some beautiful birds. We left the park around 8.30 am, got a picture by the sign and were dropped back at our hotel. We were initially planning on moving on that day but had decided to book one more night in the hotel because the pool was so nice! It was the first 'luxury' accommodation we'd stayed in and it was great to relax and catch up on some reading. My room also had a bath, I don't have one at home so I took advantage of this. 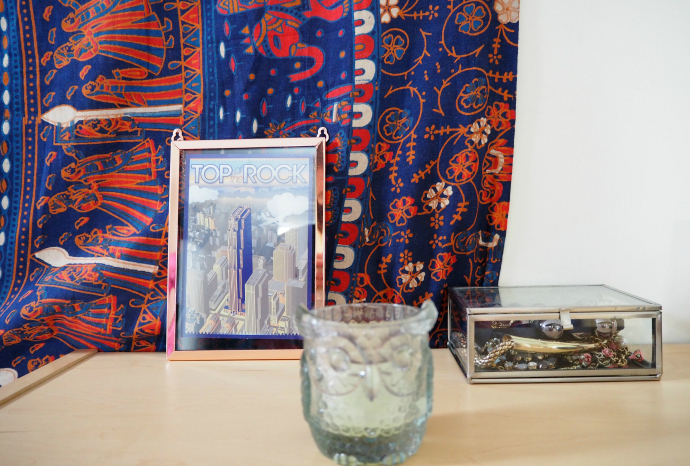 I think I may write a post about the hotel because it was so nice! You can organise a tour through most hotels, however, ours told us that we'd get a cheaper price finding a driver ourselves. Most accommodation for Yala is located in the town of Tissa or nearby. If you choose to stay in a hotel it will most likely be located just outside. You can get a tuk tuk to the main town for around 200 rupees. 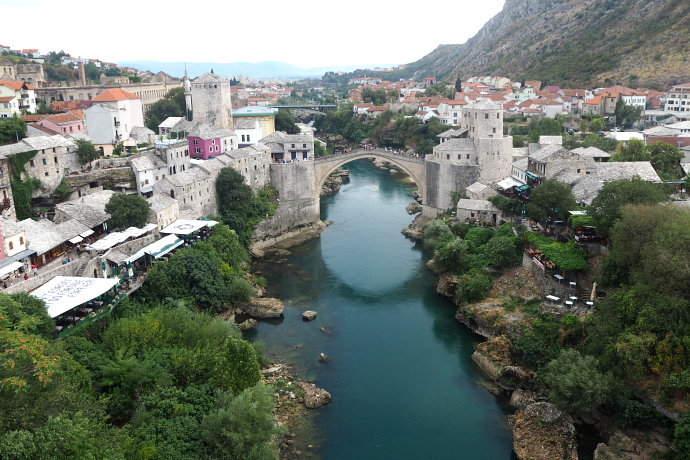 Mostar is situated on the Neretva river in Bosnia and Herzegovina. The bridge was destroyed in the 1990s and wasn't rebuilt until 2004. 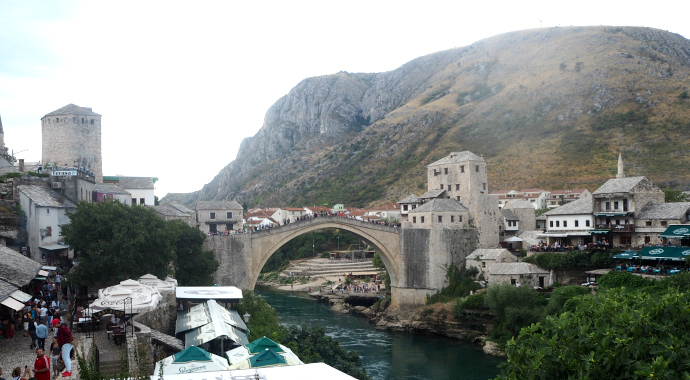 The bridge, as well as the Old Town area, is now a UNESCO heritage site. It was also my second stop on my interrail trip. 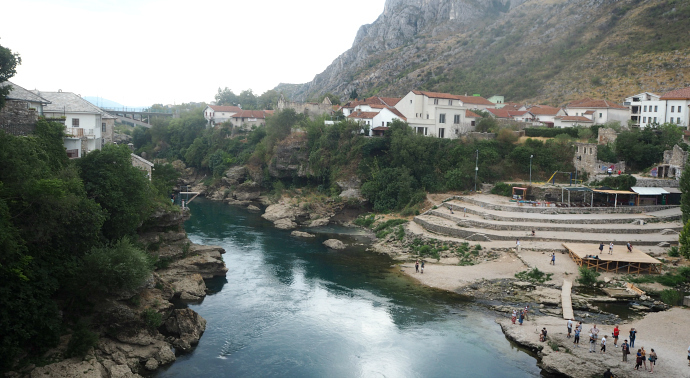 There are various places to visit around Mostar and our hostel offered a tour of some of these. However, due to time constraints we chose to prioritise the actual town. I do wish we'd had time to see the surrounding area but who knows, maybe I'll go back one day! Our hostel was around a ten minute walk from the Old Town area. The main town is pretty average. We passed a supermarket, stocking up on water and snacks then headed straight towards the Old Town. You know you've reached this area when the concrete pavement becomes cobbled streets. There are lots of little shops and stalls selling souvenirs. They're all pretty similar but the actual souvenirs were really nice rather than being tacky. I bought myself a copper bangle which I've worn everyday since! 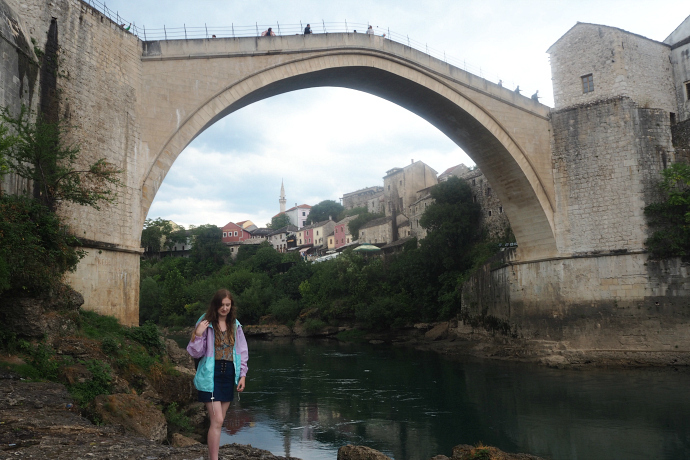 As you wander down the cobbled street you'll eventually spot the main attraction; the Stari Most. If you're feeling brave you can jump from the bridge into the water. We kept missing the jumps so didn't get a snap of anyone. 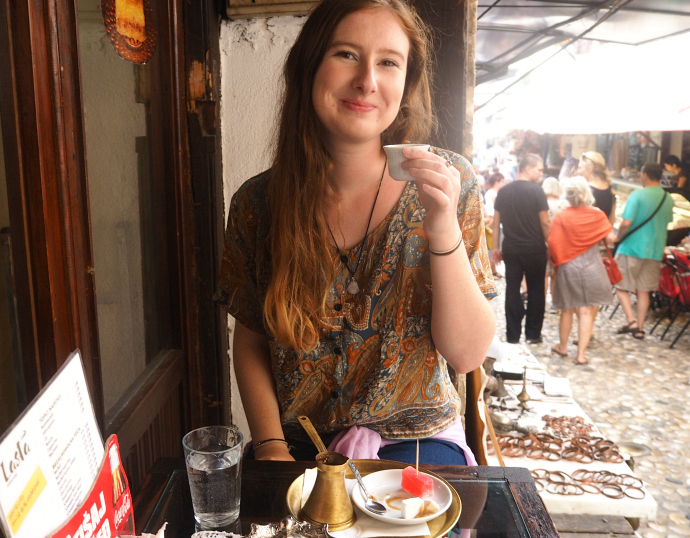 We walked over the bridge and made our way through the side streets on the other side, then headed back towards the bridge, stopping off at a cute little cafe that served traditional Bosnian coffee for 2 km (88p). 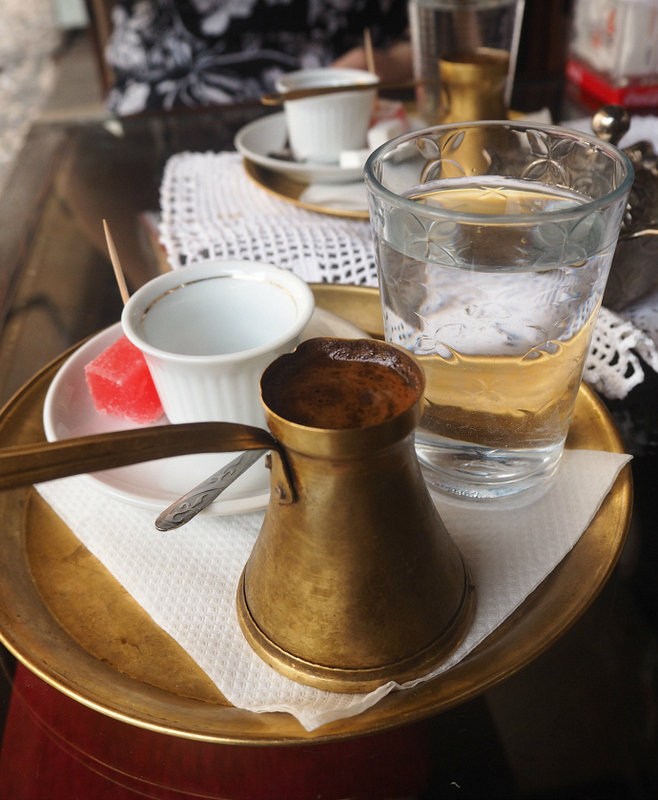 The coffee came with a piece of Turkish delight and a glass of water. The more I travelled though Europe the more I realised that getting a glass of water with your coffee was quite common, especially in Austria. The coffee was strong! So strong that Soph thought there was alcohol in it. It's very thick in consistency but after adjusting to the first taste I enjoyed it a lot. The cafe is called Lasta and is just after you walk over the bridge. You'll be able to spot it from the cute tables on the outside such as the one we sat at. After enjoying our coffee we wandered around some more. We found the staircase that lead down to the river front. We took some pictures and waited to see if anyone was going to jump off the bridge. After waiting a while with no luck we decided it was time for some lunch. There's plenty of restaurants to choose from, most are found once you've walked over the bridge (if you're coming from the Mosque side). When we were buying our postcards earlier in the day Soph had asked the women in the shop to recommend somewhere to eat. 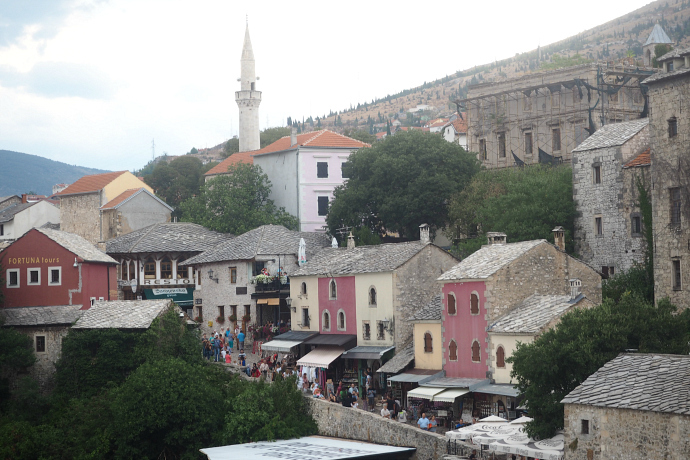 She'd been very useful and told us a restaurant that served traditional Bosnian food that was off the main drag, down a quieter street. To get to it you take your first left after you've walked over the bridge. At the end of this side street you can either turn left down the stairs to the river or right up another smaller street. You continue walking up this, you'll reach a bridge and just after that is the restaurant. The restaurant was called Hindin Han and was very cute. Some tables had a very nice view of the river. We ordered the meat platter which cost us just over £10 so about £5 each. Which was crazy cheap because there was so much. We got so much meat, two chicken breasts, kebabs, sausages and more, plus some salad and chips. Before we ordered we'd stupidly asked the waiter if the platter would be enough for two and he just laughed and said yes, when it arrived we understood why. I didn't get a picture as I was too busy eating but it was so tasty! The restaurants on the main strip did the exact same platter for €23 euros. So much more, I can't compare the actual quality or taste but it looked exactly the same and ours tasted amazing. I'm so glad we asked for a recommendation otherwise we would have paid that price at the more touristy restaurant! 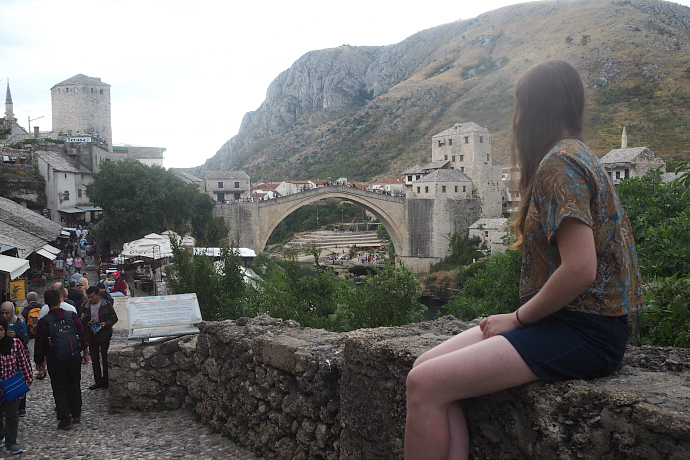 Seeing as Mostar is so picturesque I thought it would be useful to tell you where to get the bet pictures. You can probably figure it out for yourself but this might save you some time as you'll know where to head straight away. The first picture opportunity is also where you will first see the bridge. Unless you've already visited the Mosque and its lookout tower. This is just as you enter the old town. There is a wall where you can sit and get a picture. You may also need to stand on the wall to get a better angle of the bridge. There does end up being a 'line' for the spot. We managed to get some time without anyone waiting but we soon had people waiting to get a picture so we felt a bit rushed. To get down to the river you need to cross over the bridge and take the first left, turn left again and you'll find some stairs. There's a few restaurants and a bar on the way down. The area can get quite busy so you might have to wait a while to get a picture. It's also a great place to sit and eat an ice cream. Or get a snap of someone jumping from the bridge. This is where those who jumped from the bridge get out the water so if you know someone jumping this is the place to be. For this picture you'll have to pay to go up the tower. You can also pay to go into the Mosque grounds to get a picture and enjoy the view. This is cheaper than buying a ticket for the tower but the view isn't quite so good. I actually didn't go up the tower myself because I can't handle heights. I end up freezing and not being able to move because I'm so scared. Soph is fine with heights so went up alone. 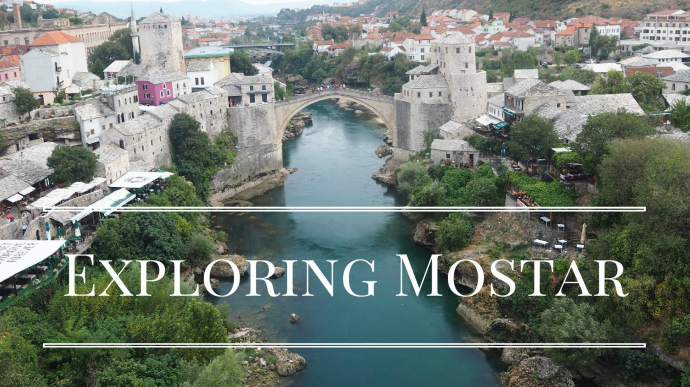 Have you visited Mostar? Did you love it as much as I did?